Startup Weekend: What to Expect? The Startup Weekend Series: This entry is part of a series of blog posts about attending a startup weekend event. These posts will help those people who have never attended a weekend hackathon or those wishing to maximise their experiences. A while ago we asked you what to expect from a startup weekend. We shared the below useful articles on startups weekends, pitching advice, and podcast on what to expect. 1. Startup Weekend FAQ – A set of helpful question and answers. 2. Pitching advice for Startup Weekend – Simple and effective tips for preparing your pitch. 3. Podcast with the CEO of Startup Weekend – An insight of the Startup Weekend events and organisation. However if you need a little more information, Howard Kingston describes his 54 hours during a Startup Weeked held in London. In his Huffington Post article he shares his experiences when “300 ambitious entrepreneurs get into a room and have 54 hours to launch a business”. It is a great case study on the weekend, and you can easily gain an appreciation for the 54 hours. Also, check out Youtube for video footage of past weekends. What are the key learnings? Be prepared, be selective, be different, be available and add value. Determine what you can offer your team. Be prepared to network, deliver a pitch, contribute to a team and stay up late! From day one, try and focus on a single idea or product. Join a team made up individuals you believe you can learn. Stand out with your idea or offering. Normally the exciting ideas get the most attraction during the weekend. Boring or safe options usually don’t attract the excitement. Be flexible, be available, be able to contribute. Make sure you can help your team on the weekend. Avoid disappearing to other events. Commit to the full 54 hours. Even if you’re not a programmer, read up on methodologies and validation processes. Check out some marketing tutorials. Create the twitter account and facebook pages. Build the vibe around the venue with posters and handouts. Good luck with your weekend. If you need some inspiration, just check out links below. Both offer some great inspiration. Remember you don’t need to create a new idea. Sometimes the best ideas are already out there – they just need someone to execute them. + Ideas Watch – A website for entreprenuers looking to share and develop ideas. Thousands of ideas available for discussion. + Flippa – Websites and applications ready for sale. Gain an insight into the website marketplace. Got something to share? Drop us a line using the social media links below! tl;dr Reddit built a platform that met the needs of visitors it attracted. By having a functional website that appeals to a wide community, appearance was not as important as maintaining it’s client base. When building a product remember – product, price, place and promotion. Why Product Functionality Often Trumps Beauty? Recently someone asked Why is reddit so famous despite such a boring interface? Google, Craigslist, Facebook, Wikipedia, Amazon, Quora and Reddit. All these popular companies began their lives with basic, simple, boring and sometimes plain ugly websites. Many still retain the boring interfaces but maintain a user base of millions of users. These sites provide functionality that fulfils the desires of it’s users, with or without beautiful front end experiences. When designing your new product or minimum viable product, consider the core functionality instead of getting stuck of the appearance. Your fancy looking product is useless if it cannot actually do anything. + Good functionality typically wins over beautiful design. Google started as a great search engine with a simplistic user interface. It didn’t need to be beautiful to bring back accurate search results. Craigslist looks ugly but delivers a service to it’s customers. After all how beautiful does a classified adverts site have to look? + Ugly can triumph beauty. Web marketers have seen ugly banner adverts attaining higher conversion rates than more colourful and attractive adverts. Humans are sometimes drawn to ugly and boring. Sometimes ugly websites can go viral. + Marketing comes down to four p’s. You need to think about all four. Often ugly sites have an intelligence and powerful marketing campaign and/or are incredible flexible. PlentyOfFish spent money on advertising to attract visitors and constantly improved functionality to meet customer needs. Note: If you particular niche or competitive advantage is design, then obviously beauty plays a part. For the rest of us, look at providing your prospective customers with something functional. + Blogging: How Do You Promote Your Blog Posts? Blogging: How To Get New Traffic To Old Blog Posts? A recent Quora question asked How do you promote old blog posts? Often a new post gains a high spike in interest when first posted. This is commonly due to promotion on social media and general timeliness of the content. After time, this attention drops off. Good posts should not be forgotten and can still be used to drive traffic. The following 10 tips may help you attract attention to your older blog posts. 1) Remember the footer: Add a footer on all new posts to older (relevant) posts. The “You might also enjoy reading this” WordPress widget can do this automatically. 2) Add links: Add a menu bar or column that includes links to older/archived articles. This includes using sitemaps, archives and tag clouds. 3) Use categories: Ensure posts have tags and categories. 5) Create a series: Many older posts can easily gel together with newer ones. 6) Updates: Add updates to older posts. A simple “Updated (Date)” with a couple of words at the top of an older post may bring attract visitors. 7) Advertise: Share older post links on other social media site you use. In forums and community sites members may ask for advice that your older blog posts can answer. 8) Avoid Repetition: Avoid reposting older posts verbatim. This may damage your search engine rankings. 9) Analytics: Study your analytics. Discover how your visitors land on your blog and exploit these “doorways”. Remember that not all visitors will first land on your index/front page. 10) Other mediums: Utilise other communication methods to promote older posts. If you have a regular email newsletter, consider adding links to older posts in these messages. Did these work for you? Have you got some suggestions? Leave us a comment! Here are some of our favourites. 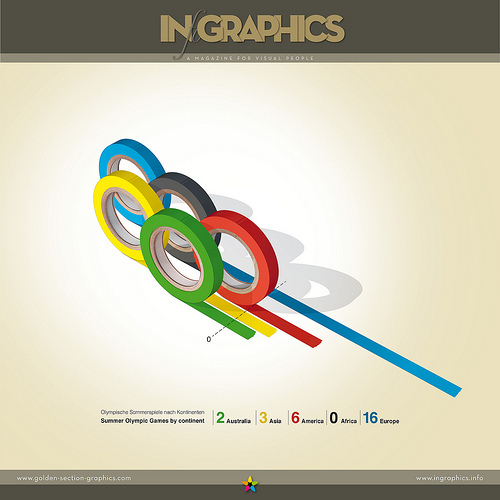 Drop us a line on Twitter if you find any other Olympic infographcs. For more infographics and data visualisations check out the Cool Infographics Blog and Google Maps Mania Blog. 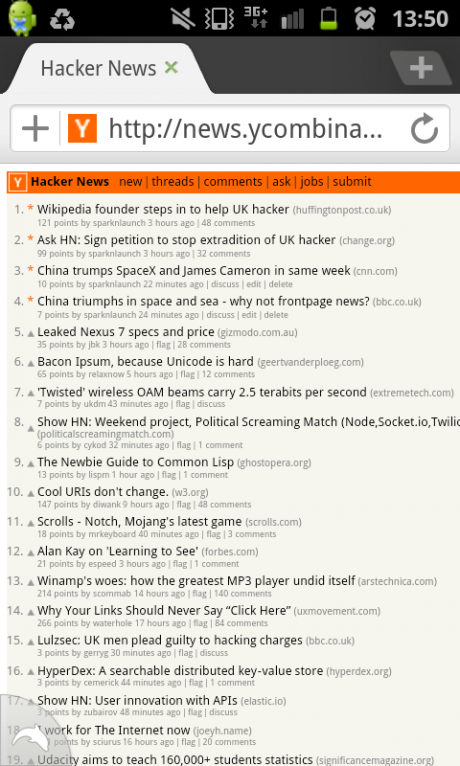 How do you get on the Frontpage of Hacker News? tl;dr This posting describes our experience of having four of our relevant Hacker News link submissions reaching the top four positions of the Hacker News frontpage. And then us later being hellbanned. How do you get on the frontpage? 1) Luck and good timing, 2) Gain karma points quickly, 3) Smart title, 4) Relevant submission, 5) Avoid downvotes. For a few minutes in late June, four of our news submissions sat on top of the Hacker News frontpage rankings. For many the response will be “so what” or “did you read the guidelines”. This posting is simply a record of observation that may or may not help anyone understand the news sites ranking algorithm. The community often questions the unknown Hacker News ranking algorithm and voting protocol. The Hacker News Slap – the phenomenon of quickly making the frontpage, only to be removed just as fast – is a mystery to many (all). The system is not perfect however is probably the best one can achieve given the large volume of submissions to the site. The site gets more than 20k of page views a month to the main domain. Once you start adding in other aggregation and referral sites you get a much larger number. Duplication of popular stories often occur (eg Steve Jobs’ death, The Facebook IPO…) but typically fresh and unique submissions stay in the top 30. 1) The extradition of a UK student to US for alleged copyright infringement. 2) China’s technological achievement in space and under the ocean. They felt totally relevant and therefore we submitted links on both stories. We submitted multiple links to try and have one stick on the Hacker News frontpage. If your link doesn’t stay on the frontpage it has zero chance of drumming up any discussion. We quickly discovered we were hellbanned, most likely by a human moderator perceiving our behaviour as a breach of written/unwritten rules. We currently remain banned but hope this posting can be useful to those wanting to share and discuss relevant content with the Hacker News community. 1. Luck and good timing – Weekends, mornings, evenings. Timing varies however weekends seem to have less noise and therefore a successful frontpage story is likely to remain on the frontpage for longer. However it is likely to experience less traffic than midweek. 2. Gain karma points quickly – Points are crucial in you getting top spot. You could collude with friends and colleagues however if detected faces downvoting. 3. Smart title – The title should be attractive enough to gain attention, but not too suggestive that it breaches guidelines and gets you downvoted or banned. 4. Relevant submission – Remember your audience. Anything off topic or irrelevant is unlikely to get any traction. 5. Avoid downvotes – Once your submission gets voted downwards, your time is up. Typically downvoting kills a submission. If you wish to share your own experiences drop us a line or leave a comment or join the Hacker News discussion. Back in 2009 Mark Pincus (CEO and Founder of gaming company Zynga) spoke to Stanford University students about the concept of “ghetto testing”. Simply you create a method to test your product idea, without actually building the product. This reflects the lean startup roots of customer development and the path towards a minimum viable product. In the Stanford Podcast Pincus describes the steps, summarised below. + Someone in the organisation tells him about a new idea for a game. + No code is written. + They tell the marketing or product manager that the product is built. Describe it in five words. + The five words are posted to the website, made live for five minutes. + Based on results of the immediate testing, they spend a week constructing a basic product (“ghetto build“). + They A/B test it and flow test it. They put it out to 1%, 10% of our users. + They build a data warehouse with the testing platform. + Based on results they either roll out the improved version, make changes or stop development. Fortunately Zynga have the luxury of a massive user base and traffic flow. Therefore for new businesses it may be more challenging to get instant feedback within 5 minutes. However this example provides a simple illustration of evaluating your idea without writing a line of code. The test doesn’t need to be online. It may be a poster on a bulletin board asking interested people to call, text or email you. It may be a small advert in the local newspaper. It could be cold calling prospective customers and asking if they would be interested in your product. Early feedback may help you proceed, pivot or bin your idea. Determining if your business or product idea is viable is an early challenge for an entrepreneur. Mocking up a quick test to execute provides quick feedback giving you the direction to stop or continue. Did this post help? Drop us a line with your testing experiences. Facebook are on the verge of making history. Their IPO will see them raise at least $16 billion and value the company at over $100 billion. Facebook’s initial public offering of stock is shaping up to be one of the largest ever. The world’s definitive online social network is raising at least $16 billion, a big windfall for a company that began eight years ago with no way to make money. Facebook priced its IPO at $38 per share on Thursday, at the high end of its expected range. If extra shares reserved to cover additional demand are sold as part of the transaction, Facebook Inc. and its early investors stand to reap as much as $18.4 billion from the IPO. The IPO values the company at around $104 billion, slightly more than Amazon.com, and well above well-known corporations such as Disney and Kraft. Whatever you think about Facebook, Zuckerberg, the bubble, this IPO represents a truly impressive story and no one can be certain what direction the share price will head on float day. New Month, New Look – What Do You Think? After several months we have finally decided to change our WordPress theme. We are now running Origin. This was to replace the Bueno theme that we found difficult to read. We are hoping the new minimalist look and feel will improve general readability and enjoyment! What do you think? Please let us know. We wrote about the power of keeping website design simple in an earlier post – Keep It Simple Stupid (KISS) – Ugly Websites That Went Viral. We will report back if keeping it simple makes any difference to our blog. We are relatively new to Hacker News. We always felt this forum best catered for programmers. However after spending several hours of reading through old and new posts we were pleasantly surprised that the audience may be slightly bigger than first thought. Yes, the majority of submissions and discussions are technology focused, but there are stories that stand out for us. These are where members share their honest and open experiences of getting their idea to the marketplace. This week alone we found the following amazing submissions. These are truly inspiring! @jstorimer shares the success of his very own eBook. His blog post and Hacker News discussion outline important tips – including setting up a sales splash page to gauge interest BEFORE writing the book. The blog post can be found here – 4 Months of ebook Sales (jstorimer.com). While the eBook title “Working With Unix Processes” may not appeal to all, the niche content has found popularity in his $17k+ of sales! @Scirra share their impressive crowd funding round on Kickstarter. They recommend doing sufficient homework on the process to achieve maximum results for the crowd funding process. The story is available here – How we got over funded in just 1 week on Kickstarter. And more information on their products at their website scirra.com. @thederek describes his milestone of reaching 800k unique views last month. An astonishing result from leveraging traffic from social media sites and writing super content with fantastic photos. Read more here – Lessons Learned After Year One As a Startup Founder. @pud posed the question “I have 404,772 users. Now what?“. Three months ago he started a social network for musicians called Fandalism. His goal was to build a database of every musician on the planet and give them a place to show their work and meet other musicians. He exceeded on his goal and now has the fortunate problem of deciding on where to take this venture. Good luck! A contributor describes how he built his online cleaning business in 4 months. The full story including discussions are available here – From an idea to replacing my full-time salary in 4 months. How I did it, and what’s next! There are many more stories available on Hacker News. Another great source is Reddit’s Ask Me Anything Section. Over the past few months we have been busy hammering away on our typewriters. Some articles we have published. Others have sat idle on our desks waiting for our head editor to review. To help us – please vote for articles you would like to see published. Reply via WordPress, tweet us (@SparkNLaunch), text us or even let us know via smoke signal. Just include the post number in your message. Have we missed something? Then send us your suggestions. Here is a list of our planned future posts…. 1. Would you buy it? – Examining the most powerful test for any new idea or product by asking the simple question of “Would you buy it?”. 2. The Lean Startup – A summary of the lean movement and our impressions on its effectiveness in the current entrepreneur climate. 3. Minimum Viable Product (MVP) – Describing the shift from product to customer development models and the importance of getting something out to the market sooner, rather than later/never. You may have nothing to lose by exposing your product today. 4. The Five Whys? (Why 5x) – Testing the ‘five whys’ approach to root cause analysis. A Taiichi Ohno (Toyota) approach to lean manufacturing now being advocated by Lean Startup author Eric Ries. 5. Project Trout meets Adwords – Our ongoing investigation into social media and the success (or rather failure) in driving traffic continues. This time we share our unsurprising results on using Google AdWords. 6. Margin Call – We try and apply lessons from the film Margin Call to the startup industry. 7. Million Dollar Viral – Research into the power of viral marketing and whether such techniques can be repeated. Can these methods be used by a small startup or are they reserved for the big boys? 8. Front Page News (Media Coverage) – We explore the steps required to make it onto the front page of Tech Crunch or Hacker News, and what this really means to the longevity of your company. 9. Market Research Monkey – Some musings on the challenges in conducting market research. 10. Using Buzzwords Badly – A closer look at the use of buzzwords and jargon, and if the misuse of words even matters. 11. Why your online presence is meaningless! – A rambling entry on why your online presence is not enough to progress your business. 12. Why Google+ Sux? – Sharing the frustration and joy of Google. We put forward an argument that Google has too many engineers building products that the average consumer cannot use. 13. Everything has been done – Success may take years and why all your ideas are already being delivered and rejected by the market. 14. Why being a deal maker matters! – A look at the important players that can make a successful startup. 15. Five Dollar Millionaire – Why $5 is suddenly a popular price point for your startup product. A couple examples on how psychological price points are being exploited by entrepreneurs. The Internet really makes your life easier. You don’t even need to brainstorm anymore. Sites like the one linked below randomly generate your very own startup name and elevator pitch. ReBridge is a really awesome way of finding out what your friends are up to. Between trolling HackerNews and eating at In-n-Out, people don’t wana work on their tasks. This is where ReBridge comes in, with 1337 Photoshop skills and an army of monkeys, ReBridge will change your paradigm on your relationship with your parents! BeamScale is a unique way of creating Kindle application pages. Between angry parents and discussing Quora on TechCrunch, people believe they can’t learn how to play an instrument. This is where BeamScale comes in, with groundbreaking techniques and lots of coffee, BeamScale will positively affect the way you like your eggs! MyDate is a better, faster way of teaching you Photoshop. between bashing Ruby and reading self-help books, people don’t wanna fund their startup ideas. This is where MyDate comes in, with groundbreaking techniques and innovative features, MyDate will positively affect your hacking skills! You read lots of varying views on selecting your business name. I tend to side with those that focus on the bigger picture. Those that talk about the whole package of customer perception and branding. When you walk down your local high street (or visit your nearest shopping mall for you Americans), it seems obvious that name is not so important. HSBC, Virgin, Tesco… Sure “Post Office” holds a real naming monopoly however it hasn’t stopped DHL and Fed Ex. Essentially while name is important, or rather avoiding wrong names is important – it is more the packaging around the name that is crucial. “It sounds like a Chinese laxative,” he said. I bet it did to most people, and they did OK.